Young opera singers from around the world will be on the Illinois State University campus this summer to stage works by Rossini and Ravel. They will be working with the Midwest Institute of Opera (MIO), which gives emerging professional singers the opportunity to perform complete operatic roles in their original languages, under the guidance of professional performers and directors. 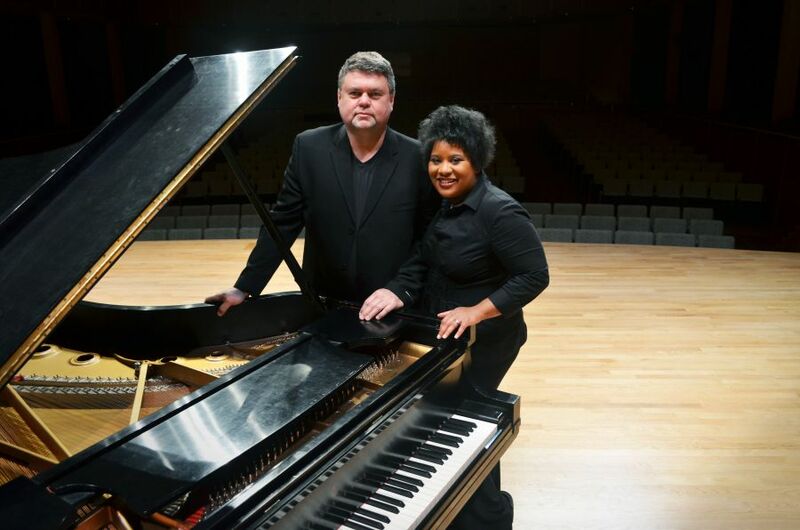 Now in its fifth year, MIO was founded by School of Music Vocal Arts Coordinator and Associate Professor John Koch and Tracy Marie Koch, a Lirico Spinto soprano and voice teacher. Both seasoned opera professionals, the husband and wife team saw a real need for a program that helps young singers hone their skills. MIO’s summer programs are intense, no-nonsense affairs, but they offer a supportive atmosphere for developing talent. Performers joining MIO in the summer study under professionals from the Metropolitan Opera Company as well as voice and piano performers and teachers drawn from across the nation. Work on all aspects of the summer season begins months in advance so that singers can concentrate completely on the music, staging and character development once they arrive. Although MIO does stage some newer works, its repertoire is drawn mainly from the well-known, established canon of operas that will develop a singer’s performance résumé. “These are the valuable, enduring operatic roles that will give them the experience they need,” said Tracy Koch. Past seasons’ performances included Bizet’s Carmen and Mozart’s The Magic Flute. This summer season, running July 18 to 30, will include Rossini’s La cenerentola, a Cinderella story; Ravel’s The Bewitched Child; and the world premiere of Sweets by Kate by Griffin Candey. Making opera accessible to local audiences is another important mission for the Kochs. MIO’s scope has broadened to include performances for children that introduce opera and concert etiquette and give kids a chance to meet the performers. The Kochs have also received grant funding to stage performances for audience members with hearing impairment. Performance opportunities have expanded to include the Music at the Manor series, featuring vocal recitals in the intimate setting of Ewing Manor; the formation of the MIO Children’s Chorus; and the Voices of MIO concert series in New York City, featuring the Kochs and alumni of the MIO summer productions. The Kochs are even exploring the possibility of taking opera outdoors with a performance staged at the Theatre at Ewing. For more information about the 2015 MIO season, visit http://midwestinstituteofopera.org/.